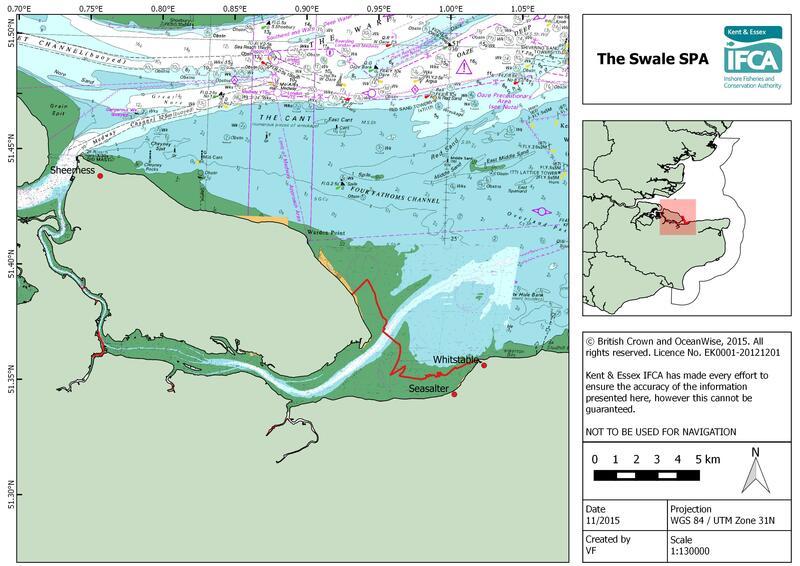 Located in north Kent, the Swale SPA covers an area of 65.15 km2. The river Swale forms a single tidal system with the river Medway, and separates the Isle of Sheppy from the Kent mainland. There is a wide range of intertidal habitats on this site which provide important feeding and roosting areas for birds, including floodplain grazing marsh, intertidal saltmarsh and intertidal mud-flats. In addition, eel grass beds and mussel beds are also found on site. This site is of importance to bird species year round, with marsh Harriers and breeding waders using it in summer, and migrating geese, ducks and waders present from autumn to spring. Fishing within the Swale SPA is varied. Beam, otter and pelagic trawling occurs occasionally within the site, as does drift netting for bass. There is some intertidal handwork gathering native oysters as well as bait digging along the shore. There is a private fishery within the site, with Faversham Oyster Company responsible for managing the dredging activities in the site.